This article is about the genus Ephedra. For the use of the plant in medicine, see Ephedra. Chaetocladus Nelson 1866 nom. illeg. 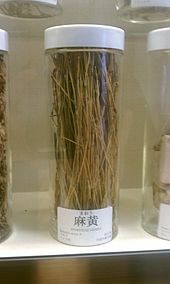 Plants of the genus Ephedra, including E. sinica and others, have traditionally been used by indigenous people for a variety of medicinal purposes, including treatment of asthma, hay fever and the common cold. The alkaloids ephedrine and pseudoephedrine are active constituents of E. sinica and other members of the genus. These compounds are sympathomimetics with stimulant and decongestant qualities and are chemically substituted amphetamines. Pollen of Ephedra spp. was found in the Shanidar IV burial site in Iraq, which led to the suggestion that its use as a medicinal plant dates to over 60,000 years ago. Paul B. Pettitt has stated that "[a] recent examination of the microfauna from the strata into which the grave was cut suggests that the pollen was deposited by the burrowing rodent Meriones persicus, which is common in the Shanidar microfauna and whose burrowing activity can be observed today". 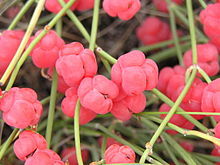 It has been suggested that Ephedra may be the soma plant of Indo-Iranian religion. Alkaloids obtained from the species of Ephedra used in herbal medicines, which are used to synthetically prepare pseudoephedrine and ephedrine, can cause cardiovascular events. These events have been associated with arrhythmias, palpitations, tachycardia and myocardial infarction. Caffeine consumption in combination with ephedrine has been reported to increase the risk of these cardiovascular events. Earliest uses of Ephedra spp. (mahuang) for specific illnesses date back to 5000 BC. Ephedrine and isomers were already isolated in 1881 from Ephedra dystachia and characterized by the Japanese organic chemist Nagai Nagayoshi of the 19th century. His work to access Ephedra drug materials to isolate a pure pharmaceutical substance, and the systematic production of semi-synthetic derivatives thereof is relevant still today as the three species Ephedra sinica, Ephedra vulgaris and to a lesser extent Ephedra equisetina are commercially grown in Mainland China as a source for natural ephedrines and isomers for use in pharmacy. E. sinica and E. vulgaris usually carry six optically active phenylethylamines, mostly ephedrine and pseudoephedrine with minor amounts of norephedrine, norpseudoephedrine as well as the three methylated analogs. Reliable information on the total alkaloid content of the crude drug is difficult to obtain. Based on HPLC analyses in industrial settings, the concentrations of total alkaloids in dried Herba Ephedra ranged between 1 and 4%, and in some cases up to 6%. For a review of the alkaloid distribution in different species of the genus Ephedra see Jian-fang Cui (1991). Other American and European species of Ephedra, e.g. Ephedra nevadensis (Nevada Mormon tea) have not been systematically assayed; based on unpublished field investigations, they contain very low levels (less than 0.1%) or none at all. ^ "Ephedrales Dumort". EU-NOMEN. Retrieved 20 January 2016. ^ Abourashed E, El-Alfy A, Khan I, Walker L (2003). "Ephedra in perspective—a current review". Phytother Res. 17 (7): 703–12. doi:10.1002/ptr.1337. PMID 12916063. ^ Solecki, Ralph S. (1975). "Shanidar IV, a Neanderthal Flower Burial in Northern Iraq". Science. 190 (4217): 880–881. doi:10.1126/science.190.4217.880. JSTOR 1741776. ^ Paul B. Pettitt (2002). "The Neanderthal dead: exploring mortuary variability in Middle Palaeolithic Eurasia". Before Farming. 1 (4): 1–26. ^ Rudgley, Richard (1993). The Alchemy of Culture. London: British Museum Press. pp. 44–45. ISBN 0-7141-2711-6. ^ Skalli, Souad; Zaid, Abdelhamid; Soulaymani, Rachida (December 2007). "Drug Interactions With Herbal Medicines". Ther Drug Monit. 29 (6): 1–8. ^ Brossi, Arnold (ed) (1989), The Alkaloids: Chemistry and Pharmacology, Vol. 35, ISBN 0-12-469535-3. ^ Cui, Jian-fang; et al. (1991). 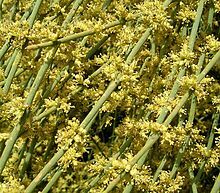 "Analysis of alkaloids in Chinese Ephedra species by GC methods". Phytochemical Analysis. 2 (3): 116–119. doi:10.1002/pca.2800020305. ^ Hegnauer R. (1962) "Chemotaxonomie der Pflanzen. I". Birkhauser Verlag, Basel; Switzerland, pp. 460–462 as cited in Roman MC (2004). "Determination of ephedrine alkaloids in botanicals and dietary supplements by HPLC-UV: collaborative study". J AOAC Int. 87 (1): 1–14. PMC 2584348. PMID 15084081. Wikimedia Commons has media related to Ephedraceae. This page was last edited on 4 January 2019, at 10:43 (UTC).